This article is about the Scottish king. For other uses, see Macbeth (disambiguation). Macbeth (Medieval Gaelic: Mac Bethad mac Findlaích; Modern Gaelic: MacBheatha mac Fhionnlaigh; nicknamed Rí Deircc, "the Red King"; c. 1005 – 15 August 1057) was King of Scots from 1040 until his death. He was titled King of Alba during his life, and ruled over only a portion of present-day Scotland. Little is known about Macbeth's early life, although he was the son of Findláech of Moray and may have been a grandson of Malcolm II. He became Mormaer of Moray – a semi-autonomous lordship – in 1032, and was probably responsible for the death of the previous mormaer, Gille Coemgáin. He subsequently married Gille Coemgáin's widow, Gruoch, although they had no children together. In 1040, Duncan I launched an attack into Moray and was killed in action by Macbeth's troops. Macbeth succeeded him as King of Alba, apparently with little opposition. His 17-year reign was mostly peaceful, although in 1054 he was faced with an English invasion, led by Siward, Earl of Northumbria, on behalf of Edward the Confessor. Macbeth was killed at the Battle of Lumphanan in 1057 by forces loyal to the future Malcolm III. He was buried on Iona, the traditional resting place of Scottish kings. Macbeth was initially succeeded by his stepson Lulach, but Lulach ruled for only a few months before also being killed by Malcolm III, whose descendants would rule Scotland until the late 13th century. Macbeth is today best known as the main character of William Shakespeare's tragedy Macbeth and the many works it has inspired. 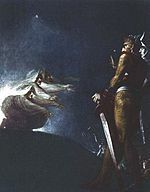 However, Shakespeare's Macbeth is based on Holinshed's Chronicles (published in 1577) and is not historically accurate. Macbeth's full name in Medieval Gaelic was Mac Bethad mac Findlaích. This is realised as MacBheatha mac Fhionnlaigh in Modern Gaelic, and anglicised as Macbeth MacFinlay (also spelled Findlay, Findley, or Finley). The name Mac Bethad, from which the anglicised "MacBeth" is derived, means "son of life". Although it has the appearance of a Gaelic patronymic it does not have any meaning of filiation but instead carries an implication of "righteous man" or "religious man". An alternative proposed derivation is that it is a corruption of macc-bethad meaning "one of the elect". Some sources make Macbeth a grandson of King Malcolm II and thus a cousin to Duncan I, whom he succeeded. He was possibly also a cousin to Thorfinn the Mighty, Earl of Orkney and Caithness. Nigel Tranter, in his novel Macbeth the King, went so far as to portray Macbeth as Thorfinn's half-brother. However, this is speculation arising from the lack of historical certainty regarding the number of daughters Malcolm had. 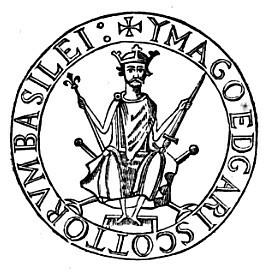 Malcolm II's grandson Duncan (Donnchad mac Crínáin), later King Duncan I, was acclaimed as king of Alba on 30 November 1034, apparently without opposition. Duncan appears to have been tánaise ríg, the king in waiting, so that far from being an abandonment of tanistry, as has sometimes been argued, his kingship was a vindication of the practice. Previous successions had involved strife between various rígdomna – men of royal blood. Far from being the aged King Duncan of Shakespeare's play, the real King Duncan was a young man in 1034, and even at his death in 1040 his youthfulness is remarked upon. Duncan's early reign was apparently uneventful. His later reign, in line with his description as "the man of many sorrows" in the Prophecy of Berchán, was not successful. In 1039, Strathclyde was attacked by the Northumbrians, and a retaliatory raid led by Duncan against Durham turned into a disaster. Duncan survived the defeat, but the following year he led an army north into Moray, Macbeth's domain, apparently on a punitive expedition against Moray. There he was killed in action, at Bothnagowan, now Pitgaveny, near Elgin, by the men of Moray led by Macbeth, probably on 14 August 1040. On Duncan's death, Macbeth became king. No resistance is known at that time, but it would have been entirely normal if his reign were not universally accepted. In 1045, Duncan's father Crínán of Dunkeld (a scion of the Scottish branch of the Cenél Conaill and Hereditary Abbot of Iona) was killed in a battle between two Scottish armies. John of Fordun wrote that Duncan's wife fled Scotland, taking her children, including the future kings Malcolm III (Máel Coluim mac Donnchada) and Donald III (Domnall Bán mac Donnchada, or Donalbane) with her. On the basis of the author's beliefs as to whom Duncan married, various places of exile, Northumbria and Orkney among them, have been proposed. However, E. William Robertson proposes the safest place for Duncan's widow and her children would be with her or Duncan's kin and supporters in Atholl. According to the Orkneyinga Saga, in the war which followed, Thorfinn defeated Karl in a sea-battle off Deerness at the east end of the Orkney Mainland. 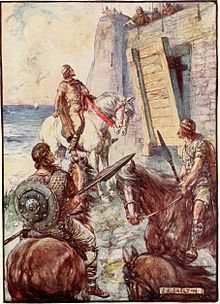 Then Karl's nephew Mutatan or Muddan, appointed to rule Caithness for him, was killed at Thurso by Thorkel the Fosterer. Finally, a great battle at Tarbat Ness on the south side of the Dornoch Firth ended with Karl defeated and fugitive or dead. Thorfinn, the saga says, then marched south through Scotland as far as Fife, burning and plundering as he passed. A later note in the saga claims that Thorfinn won nine Scottish earldoms. In 1052, Macbeth was involved indirectly in the strife in the Kingdom of England between Godwin, Earl of Wessex and Edward the Confessor when he received a number of Norman exiles from England in his court, perhaps becoming the first king of Scots to introduce feudalism to Scotland. [citation?] In 1054, Edward's Earl of Northumbria, Siward, led a very large invasion of Scotland (Duncan's widow and Malcolm's mother, Suthed, was Northumbrian-born; it is probable but not proven that there was a family tie between Siward and Malcolm). The campaign led to a bloody battle in which the Annals of Ulster report 3,000 Scots and 1,500 English dead, which can be taken as meaning very many on both sides, and one of Siward's sons and a son-in-law were among the dead. The result of the invasion was that one Máel Coluim, "son of the king of the Cumbrians" (not to be confused with Máel Coluim mac Donnchada, the future Malcolm III of Scotland) was restored to his throne, i.e., as ruler of the kingdom of Strathclyde. It may be that the events of 1054 are responsible for the idea, which appears in Shakespeare's play, that Malcolm III was put in power by the English. Macbeth did not survive the English invasion for long, for he was defeated and mortally wounded or killed by the future Malcolm III ("King Malcolm Ceann-mor", son of Duncan I) on the north side of the Mounth in 1057, after retreating with his men over the Cairnamounth Pass to take his last stand at the battle at Lumphanan. The Prophecy of Berchán has it that he was wounded and died at Scone, sixty miles to the south, some days later. Macbeth's stepson Lulach was installed as king soon after. Macbeth's life, like that of King Duncan I, had progressed far towards legend by the end of the 14th century, when John of Fordun and Andrew of Wyntoun wrote their histories. Hector Boece, Walter Bower, and George Buchanan all contributed to the legend. In Shakespeare's play, which is based mainly upon Raphael Holinshed's account, Macbeth is initially a valorous and loyal general to the elderly King Duncan. After being flattered by Three Witches and his own wife, Macbeth rationalizes that murdering his king and usurping the throne is the right thing to do. Ultimately, however, the prophecies of the witches prove misleading, and Macbeth alienates the nobility of Scotland and is defeated in battle by Prince Malcolm. As the King's armies disintegrate he encounters Macduff, a refugee nobleman whose wife and children had earlier been murdered by Macbeth's death squads. Upon realizing that he will die if he duels Macduff, Macbeth at first refuses to do so. But when Macduff explains that if Macbeth surrenders he will be subjected to ridicule by his former subjects, Macbeth vows, "I will not yield to kiss the ground before young Malcolm's feet, to be baited by a rabble's curse." He chooses instead to fight Macduff to the death. Macbeth is then slain and beheaded and the play ends with Prince Malcolm planning his coronation at Scone. The likely reason for Shakespeare's unflattering depiction of Macbeth is that King James VI and I was descended from Malcolm III via the House of Bruce and his own House of Stewart, whereas Macbeth's line died out with the death of Lulach six months after his step-father. King James was also thought to be a descendant of Banquo through Walter Stewart, 6th High Steward of Scotland. In a 1959 essay, Boris Pasternak compared Shakespeare's Macbeth to Raskolnikov, the protagonist of Crime and Punishment by Fyodor Dostoevsky. Pasternak explained that neither character begins as a murderer, but becomes one by a set of faulty rationalizations and a belief that he is above the law. Lady Macbeth has gained fame along the way. In his 1865 novel Lady Macbeth of the Mtsensk District, Nikolai Leskov updated The Tragedy of Macbeth so that it takes place among the Imperial Russian merchant class. In an ironic twist, however, Leskov reverses the gender roles – the woman is the murderer and the man is the instigator. Leskov's novel was the basis for Dmitri Shostakovich's 1936 opera of the same name. Macbeth appears as a character in the television series Gargoyles with the Gargoyle Demona playing a crucial role in both his rise and fall as King of Scotland. He was voiced by John Rhys-Davies. ^ William Forbes Skene, Chronicles, p. 102. ^ a b c Aitchison, Nicholas Boyter (1999). Macbeth:man and myth. p. 38. ISBN 978-0750918916. ^ Davis, J. Madison (1995). The Shakespeare Name and Place Dictionary. p. 294. ISBN 978-1884964176. ^ Knapp, Tom. "Nigel Tranter: Macbeth the King". Rambles.net. Retrieved 8 August 2016. ^ "Scotland Kings". Foundation for Medieval Genealogy. Retrieved 8 August 2016. ^ Anglo-Saxon Chronicle, Ms. E, 1031. ^ Compare Duncan, Kingship of the Scots, pp. 29–30 with Hudson, Prophecy of Berchán, pp. 222–223. ^ Hudson, Prophecy of Berchán, p. 223; Duncan, Kingship of the Scots, p. 33. ^ Duncan I as tánaise ríg, the chosen heir, see Duncan, The Kingship of the Scots, pp. 33–35; Hudson, Prophecy of Berchán, pp. 223–224, where it is accepted that Duncan was king of Strathclyde. For tanistry, etc., in Ireland, see Ó Cróinín, Early Medieval Ireland, 63–71. Byrne, Irish Kings and High-Kings, pp. 35–39, offers a different perspective. ^ Annals of Tigernach 1040.1. ^ G. W. S. Barrow, Kingship and Unity: Scotland 1000–1306, Edinburgh University Press, 1981, p. 26. ^ Hudson, Prophecy of Berchán, pp. 223–224; Duncan, The Kingship of the Scots, pp. 33–34. ^ Annals of Tigernach 1045.10; Annals of Ulster 1045.6. ^ Robertson, Scotland under her Early Kings, p. 122. Hudson, Prophecy of Berchán, p. 224, refers to Earl Siward as Malcolm III's "patron"; Duncan, The Kingship of the Scots, pp. 40–42 favours Orkney; Woolf offers no opinion. Northumbria is evidently a misapprehension, further than that cannot be said with certainty. ^ However Macbeth's father may be called "jarl Hundi" in Njál's saga; Crawford, p. 72. ^ Anderson, ESSH, p. 576, note 7, refers to the account as "a fabulous story" and concludes that "[n]o solution to the riddle seems to be justified". ^ Orkneyinga Saga, cc. 20 & 32. ^ Taylor, p. 338; Crawford, pp. 71–74. ^ Florence of Worcester, 1052; Anglo-Saxon Chronicle, Ms. D, 1054; Annals of Ulster 1054.6; and discussed by Duncan, The Kingship of the Scots, pp. 38–41; see also Woolf, Pictland to Alba, pp. 260–263. ^ The exact dates are uncertain, Woolf gives 15 August, Hudson 14 August and Duncan, following John of Fordun, gives 5 December; Annals of Tigernach 1058.5; Annals of Ulster 1058.6. ^ "The History of Scotland by John Leslie, 1578". British Library. Retrieved 8 August 2016. Wikisource has the text of the 1911 Encyclopædia Britannica article Macbeth.